I’ve been obsessed with radio and podcasts for a long time. I listen to them constantly: while I’m sewing, while I’m editing photos, while I’m cooking. I listen to all kinds: storytelling podcasts, news shows, business advice, those shows where a couple of funny people sit around and drink beer with mics in front of them. I’ve also enjoyed some crafty shows from time to time, including Abby’s While She Naps and of course Christine’s Thread Cult. I’ve always wanted to do one, but never quite had a clear vision of what it would be like. That is, until we’d been working on Seamwork for a while. As I talked to more and more women, I kept hearing these amazing stories: designers struggling to produce american-made clothing; sewists learning to cope with huge life changes; women finding peace with their bodies through making clothes. Somewhere along the line, I realized that these stories could be shared in a different way, a way that would help connect people. Audio is such a powerful and emotionally resonant medium. I think it can bring a much more personal and human perspective than even the written word. I can tell you that I feel much closer to the people I’ve interviewed just by hearing their stories, in their own words. In the first few months, you’ll hear from some other indie pattern designers about how and why they started their businesses. You’ll hear from sewists about the ways sewing has changed their lives and helped them overcome some pretty difficult hardships. You’ll even hear from people in the apparel industry about what it’s like to be a small designer these days and to actually produce clothing. In other words, the focus is more human stories than on the how-to or the businessy side, although a bit of that will be mixed in. I like to talk about the things that are hard to talk about: Money. Feelings. Family. Our bodies. 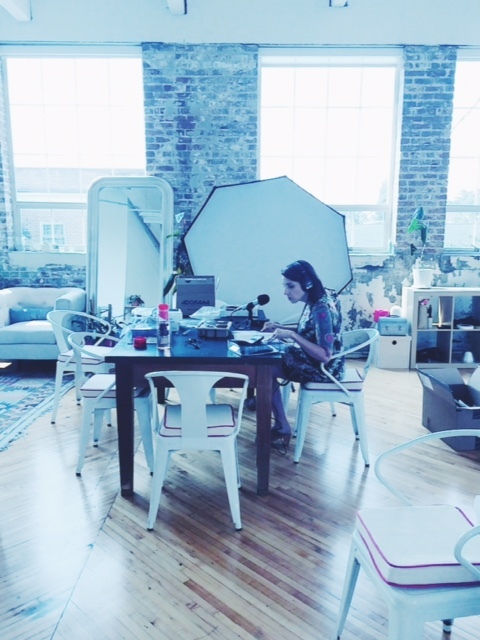 Seamwork radio will be starting up in 1-2 weeks (there’s some uncertainty due to the way iTunes works, so stay tuned). The shows will be every other week for now, because I am doing it all myself: writing, recording, editing, all of it. It’s been an overwhelming challenge, but I’m really looking forward to putting out the first few episodes, however wonky they might be. You’ll be able to subscribe to the show on iTunes or your app of choice. I’ll also be posting the audio here on the blog, and we’ll set up a page with all the episodes and show notes over on the Seamwork site. Finally, if you have an interesting story from your own life related to clothing, sewing, or anything related, I’d love to hear from you! To submit your idea, I ask that you record a short pitch (you can use the voice memo app on your phone or something similar on your computer) and submit the file to us here. Or, if you have an idea of someone I should talk to, feel free to leave a comment here with your idea! I’ve talked to some wonderful people so far, and have a growing list of other folks to talk to. I’d love to hear your thoughts. I’m so excited to read this! Podcasts are a format that I adore as they fit into my day so well – I’m really looking forward to hearing your first interview. Love, love, love the idea!!! Great idea! I’ve already sent you an e-mail with some recommendations and I’m looking forward to your first episode! A new podcast related to my interests will be super! I’m also a dedicated listener to “While she Naps” and “Thread Cult”. I can’t wait to subscribe! Thank you. This is so exciting! I’ve been burning through Thread Cult (I’m late to the party), so I’m glad to know there will be another great podcast out there to start soon! Yes, we plan to get it on Stitcher as well! We’re researching other services too, so if anyone reading has an app they use, let me know! I am SO excited about this, ever since you first announced it! Like you, I am a huge podcast listener, but I actually don’t like any of the crafting/sewing ones out there–from my perspective, they all tend to focus too much on either the artistic process (which is fascinating the first few times, but gets a little repetitive after I’ve heard five designers describe essentially the same thing) or they are very project-based (and I don’t have the desire–or time–to sit around and wait for someone to tell me the next step in a project. I’ve got too many things to make as it is!!!). Stories on sewing is just about the greatest thing for me! Ce sera uniquement en anglais ou ce sera traduit en français ? Je trouve que c’est une excellente idée, sarai. Can’t wait! I haven’t listened to either of the podcasts you wrote about, but I did enjoy The Sewing Affair when it was updated regularly. It will be nice to add a new crafty podcast to my queue. I can’t wait to listen to the podcast. And thanks for the introduction to the other podcasts– cant wait to listen to them! How exciting!! I love this form of storytelling (my best friend once suggested I intern for This American Life – really should’ve listened to him). Hearing someone tell their story can create such a deep connection. Can’t wait! And bravo :-). I love this news!!!! I’m fixated on podcasts as well, such a great way to get through the day. Thanks for the heads up on the podcasts you listen to. I used to listen to one called Sew Forth Now, but she stopped podcasting a while ago. I am so looking forward to Seamwork Radio! This will be wonderful. I listen to audio books all the time while I’m sewing, cooking, painting the house … Looking forward to a new audio experience. Looking forward to this, very excited ! I also love listening to crafty podcasts and wish there were more of them, so I’m looking forward to yours! I like the idea of chatting with people about their experiences sewing a particular pattern or project. A segment for sew alongs or even the wardrobe architect series might be a good addition. A segment about failures, mistakes (learning experiences) would be awesome to hear. I work in the RTW fashion industry and I’d love to hear more about it from other people in the industry (production pattern-makers, designers, merchandisers, technical designers, sample sewers etc…)’. Good luck! I love listening to podcasts while I sew, so the idea of listening to Seamwork Radio while I’m making a Seamwork pattern just blows my mind!! Thank you so much for continuing to provide me with inspiration and motivation in so many ways! This sounds very exciting Sarai and I’m really looking forward to listening! Will you be interviewing Natalie Chanin? I’d love to hear more of her story and I think she’d have some really valuable insights to share on sewing, the fashion industry, community, employment and social responsibility. I love reading this news! I really enjoy listening to sewing-related podcasts (as much as possible with five kiddos in the house!) and I am excited to add yours to my podcast addict list when it debuts. Oh, very exciting! Podcasts are my favourite thing to listen to when doing something moderately brainless like hemming. This can only be a good thing! Sounds fabulous! Interview this lady! So very excited about this. I listen to several knitting podcasts, (and also other types of podcasts) and have long wanted a good sewing podcast to listen to!! Listening goes along with hand-work so well. After reading your post I had this dream that I met you and you had a British accent! Adding the element of sound/voice/radio to your magazine will enhance the experience for many of us…..especially those who have trouble with written text. Yay! Hi I’m a lifelong sewer from the UK- note to Gretchen British is not an accent! I speak English, with no regional twist, and am from England- so I don’t have an accent! What you are imagining is a lack of accent, really. I started sewing when I was a child – I always loved making things. When I hit teenage I became a very unbalanced shape, so I started to make clothes for myself. I was 20 years early to the upcycling trendy buying things for a few pence in charity (thrift) shops and remodelling them. I went to university (college) and made most of my clothes and then to work and time became the enemy. & years into a high powered career I became disillusioned threw it all in and went back to college to learn to make theatre and film costumes. I started my new career at the National Theatre in London and after 3 years left to freelance which I still do to this day. I also teach sewing at local community centres. I don’t make all my own clothes as I find sourcing really good fluid dressmaking fabrics like those in expensive RTW quite difficult but I still love to sew for fun and for work (I also knit, crochet and make the occasional patchwork for fun). I find only a career making things feeds my soul- everything else,no matter how exciting or lucrative just drains it slowly.